Agency Insurance Company ("AIC") is small regional auto insurance carrier based in Hanover, Maryland. AIC was initially founded in 1990 as an affordable alternative auto insurance provider in Maryland. Since then AIC has expanded into Pennsylvania, Virginia and also Florida but Maryland remains its primary focus. AIC offers personal auto insurance as well as commercial vehicle insurance. AIC claims to offer highly competitive rates with a full host of typical coverage options and features. In contrast to other small insurance carriers, AIC offer coverage for all types of vehicles from motorcycles to trailers. AIC also offers customers highly flexible arrangements for premium payments that are not available with large national companies. Agency Insurance Company is not a direct access carrier. Instead, AIC policies are sold only through independent insurance agents. This means you cannot get a quote or purchase a policy from AIC online. You have to go to an AIC insurance agent. This means that despite their claims to the contrary, AIC's rates are most likely higher than the insurance rates you would pay for a policy from a large national company. Small, non-direct insurance companies like AIC are simply not able to offer the discounted rates that large national companies can offer. AIC's auto claims system is somewhat old fashioned compared to large, national insurance carriers. All of the big insurance companies offer automated, online systems for submitting claims. Most big insurance companies even have apps that enable customers to submit claims on their smart phones. AIC does not offer any of this. AIC auto claims must be submitted by phone, fax or email. The phone line for claims is 27/4 but after normal business hours incoming calls are outsourced to a call service. Submitting a claim by email (claims@aiconline.com) is the closest thing that the company has to an online claims system. No matter how a claim is submitted, however, it is apparently only handled by AIC claims adjusters working during normal business hours. AIC is a very small, regional insurance company with a limited number of insureds. As a result, the volume of online customer reviews and comments is necessarily very limited in comparison to larger companies. This makes the online reviews and comments somewhat less informative. With that being said, however, the online customer reviews that are available for AIC are overwhelming negative. Many of the highly negative customer reviews related to AIC's claims handling. Agency Insurance does have a very positive rating with the Better Business Bureau, but it is based on an extremely limited sample size of just 2 customer reviews and 12 complaints. Jane has car insurance with Agency Insurance. Jane is out on the road and gets rear ended by Adam. Jane's insurance company, AIC, ends up paying $10,000 for Jane's damages from the accident. AIC then brings a subrogation claim against the at-fault driver, Adam (and his insurer), to recover their $10,000 loss. For a very small insurance company, AIC appears to file a large number of subrogation cases in Maryland. A simple search on Maryland Judiciary Case Search for cases involving Agency Insurance Company returns a surprisingly high number of results. Almost all of the cases appear to be subrogation claims by AIC. Over the last several years, AIC has filed an average of about 25 subrogation cases a year. This is a high number relative to AIC's comparatively small size. 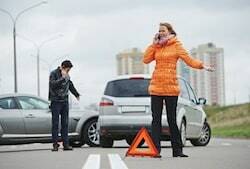 If you were recently involved in a car accident and you need to make a claim for damages against someone who is insured by AIC (or another company), you need to retain good auto accident firm that delivers results. Miller & Zois provides auto accident clients with effective, efficient results. Out attorneys can help you get the most out of your case. Call now at 800-553-8082 or get a free online consultation.